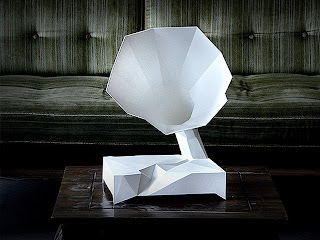 This Neo Gramophone is the image, simplicity and feeling of a traditional gramophone transported in the 21st century. To transport those memories into our time this new gramophone got first stripped from it’s known featured and got invented completely new. 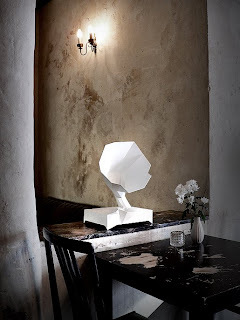 The clean abstract shape, reminding of a growing polygonal plant, has the looks of an object from the future but is still containing the basic optical structure of a traditional gramophone, which combines old and new in a charming way. High quality materials help to keep the once hand-made character of the gramophone alive. Playing vinyl back in the days the gramophone is now able to play your personal musical selection via streaming directly from itunes or directly by loading music on it via bluetooth. A simple subsurface menu (reacts upon touching the menu area) provides easy playing, simple usage like the traditional gramophone. Clean and perfect sound is a must today so the inside of the neo-gramophone features multiple speakers and a subwoofer with the horn as the bass-reflex tube..We are currently looking for investors to take this project further.